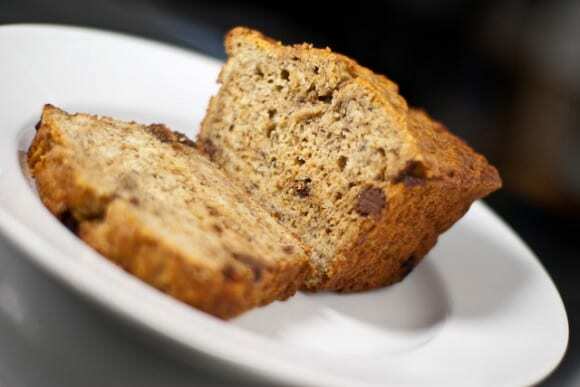 Like chocolate chip cookies, banana bread has adherents of several schools of thought. On one hand, there are those that believe that a good banana bread should be more like a bread: dense, slightly chewy and not very sweet. On the other end of the spectrum there are those that like a sweet, moist, cake-like crumb. That’s not even getting into all the things people add, like nuts, chocolate and dried fruit. For me, the perfect banana bread is very moist, with a dense, tender crumb that actually tastes like bananas. Because I tend to eat it as a breakfast food, I don’t like the bread to be too sweet, but I do love having sweet morsels of chocolate tucked away in the bread just waiting to be discovered. To get the great banana flavor with mild, natural sweetness, I always use very ripe bananas with only a small amount of dark brown sugar. I actually hate eating the fruit once they develop even one brown spot, so I often only have 1 or 2 off the bunch before I’ll stop eating them. Given the natural ripening proecss of bananas they quickly become suitable banana bread material. If you’re impatient and want to make them ripen faster, dab a bit of alchohol on the cut stem then put them in a brown paper bag. 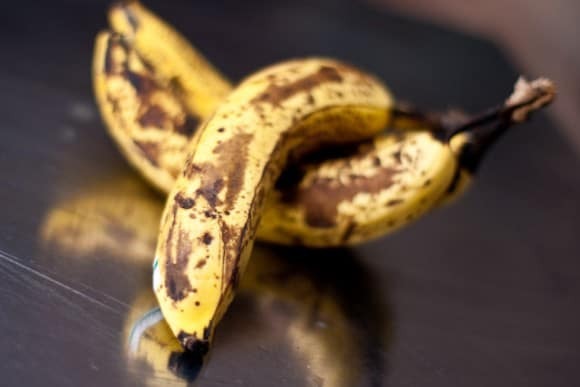 This promotes the natural accumulation of ethylene gas emitted by the ripening bananas which further accelerates ripening. This gas is so effective you can actually hasten the ripening of other fruits and vegetables by adding them to the bag with the bananas. To get a nice dense crumb that’s not too heavy, I use more bananas, less butter and a buttermilk/baking soda combo for some extra lift. Together with the lemon juice mashed with the bananas, the buttermilk not only helps the bread rise, but it also adds a mild tang that I like. The other benefit of adding the lemon juice is that it keeps the bananas from turning the cake an unappetizing gray color. Put the oven rack in the middle position and preheat to 350 degrees F. Butter and sugar a 9" loaf pan. In a medium bowl, melt the butter and allow it to cool a little. Measure out the buttermilk and vanilla into a small bowl. Add the egg yolks to the melted butter and the egg whites to the buttermilk. Whisk each seperately until smooth and creamy. Add the buttermilk mixture to the butter mixture and whisk to combine. Mash the bananas with the back of a fork with the juice of half a lemon. Add this to the liquids and stir to combine. Dump the liquids into the dry ingredients then gently fold it all together until most of the big lumps of flour are gone. You don't want to over-mix it and it's okay if there are some small bits of flour left. Put it in your loaf pan and gently even off the top. Put it in the oven until a skewer inserted into the middle comes out clean, about 50 minutes to 1 hour. Allow it to cool on a rack in the pan. Hmm, pistachios will be good! I like banana bread like you, I prefer moist over chewy. This turned out chewy, almost hard! I actually threw it out. Now that I think about it, I didn’t add any baking soda, I wonder if that made a difference?? Anyway, I will try to make yours!! It looks fantastic! Gorgeous texture on your bread; and as bananas are a favourtite around here, I will be trying this one this weekend. That roasting idea from Jenni sounds interesting too. I love banana bread! And great tip on the ripening. There are so many recipes for banana bread out there that I’m ken to try them all. I like the addition of buttermilk…at some point I need to try this. Thanks Marc. Very nice! I love the buttermilk in this. This bread sounds wonderful, and exactly how I like it. I will definitely try that roasting tip. Thanks! The lack of baking soda/powder is almost certainly the reason why your bread was so dense. While you have some egg in there, it just isn’t enough to raise a bread/cake with this much fruit in it. Another thing to keep in mind is that the more you mix it the more gluten will form which means it will be more chewing/tough. For banana bread (like pancake batter), you want to mix until it’s all moistened and there are no huge lumps of flour, but it should still be very “chunky”. Yummo, this looks fantastic! I absolutely adore the banana-chocolate combo. I wonder if it would work if I used 3 tbs of regular butter and 3 tbs of peanut butter? I love a good banana bread and like you only use super/over ripe bananas! I’ve heard about the banana in the bag trick. But never heard about the alcohol part. Very interesting! If I have a bunch of bananas that get too ripe, I usually freeze them, peeled, in plastic bags. That way, I always have a ready supply for baking banana bread or for making killer, creamy smoothies. Yum! I love bananas and chocolate! Thanks for the tips Marc! I’m going to redo the recipe now! Banana bread sounds and looks good! Chocolate makes it even better! SO many good tips in this feature! May I please have a slice with my morning tea? That’s it! We’re making banana bread stat! Your photos are amazing lately. I really love banana stuffs and I like your recipe. Thanks for the great ideas Sari! I’ve never tried flax in it but it soundsdelicious. As for whole wheat flour, I have done it, and it get a nice nuttyflavour. Thanks for the great ideas Sari! I've never tried flax in it but it soundsdelicious. As for whole wheat flour, I have done it, and it get a nice nuttyflavour. Sari – Did you add the yogurt in addition to the buttermilk, or instead of it? If you tried the 1-3/4 flour + 1/2 cup ground flax, which proportions of buttermilk and/or yogurt worked best? Gomensai..I was for sure doomed from the get go: oven decided to go into clean mode; it’s time to replace said oven. There I was w/banana bread in hand & no oven (unless I wanted charred banana bread). I was not happy. Lo! My toaster oven saved the day.Good results, altho I had to stay present & monitor the oven, testing to make sure it was done. Delicious….Question Sensei: why separate the eggs? Yikes! sounds like a harrowing experience. Glad to hear it all worked out in the end! The reason for separating the eggs is because the yolk is a natural emulsifier (allows oils and water to mix). By combining the yolk with the butter and then adding the mixture to the buttermilk, it allows you to distribute the butter more evenly rather than having it all clump up and separate.